Located adjacent to the lovely little town of Calabash, North Carolina (just 20 minutes north of Myrtle Beach), you need to capture the atmosphere of Brunswick Plantation. 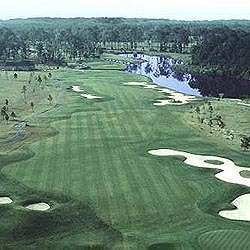 Every hole at Brunswick Plantation requires a combination of mental strategy and execution. The 15th hole is always a favorite. It features an island green, accessible by bridge and encircled by oyster shells. Brunswick's penncross bentgrass greens make downhill putts very delicate. This facility is always an interesting challenge and reflects the best in North Carolina hospitality and charm.